The worldwide leader in delivering smart made simple computing accessories for the mobile consumer, Kensington has announced the launch of an innovative USB peripheral sharing device – ShareCentral, which available in three configurations for controlling one (ShareCentral 1), two (ShareCentral 2) or five (ShareCentral 5) USB devices between any 2 computers. 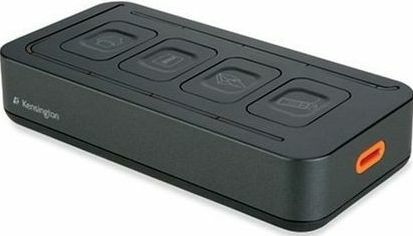 Share up to five different USB peripherals – Instantly share access to multiple USB peripherals between two computers at the press of a button. Users gain instant access to their USB peripherals by plugging one simple USB cable into their computers. LED lights on the product indicate which computer has access. Easy to set up, simple and straightforward – ShareCentral is easy to set up and easy to use with no network or software required. Plug–n–play right out of the box! No more cord clutter – ShareCentral eliminates cable mess by connecting device cables into a central desktop unit; also wall mountable. Easy printer sharing –Simply press a button to switch the USB printer from one computer to another. ShareCentral 2 and ShareCentral 5 Automatic Print Sharing will detect and automatically switch to the computer that is trying to print, conveniently eliminating the need for any buttons to be pressed (available for Windows XP and Windows Vista). Adaptable and personal – All USB ports are independently controlled by a button and assignable to either computer. Each button comes with interchangeable magnetic keycaps for personalization to user’s device and specifications. The new Kensington ShareCentral 5 (SKU K33901US), Kensington ShareCentral 2 (SKU K33900US) and Kensington ShareCentral 1 (SKU K33903US) are expected to be available later this month for $79.99, $59.99 and $39.99, respectively.